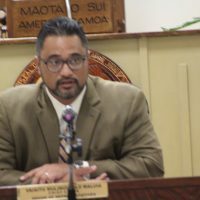 Attorney General Talauega Eleasalo Ale has disputed that his office ever gave a legal opinion that the firing range project did not have to go through the Territorial Zoning Board because it was built on federal property. KHJ News reported that the House Public Safety Committee learned from ASG officials at a hearing on January 28 that the Attorney General’s Office informed the Territorial Zoning Board that construction of the firing range facility should not be stopped. Information provided by Rep. Vesi Fautanu Jr., a member of the Zoning Board, indicated that the board had sought a stop order on the project, but Assistant AG William Ledoux informed the Board that per an opinion from the Attorney General’s Office, the project cannot be stopped because it was built on federal property.